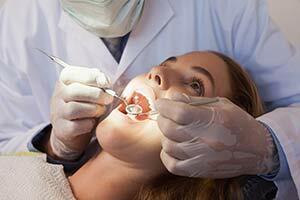 Four out of five people have periodontal disease and don’t know it! Most people are not aware of it because the disease is usually painless in the early stages. A bacterial infection affects the gums when the toxins contained in plaque begin to irritate and inflame the gum tissues. Once this bacterial infection colonizes in the gum pockets between the teeth, it becomes much more difficult to remove and treat. Periodontal disease is a progressive condition that eventually leads to the destruction of the connective tissue and jawbone. If left untreated, it can lead to shifting teeth, loose teeth and eventually tooth loss. Longer-looking teeth – Periodontal disease can cause loss of gum around a tooth making the teeth appear longer. Scaling and root planing – For Advanced Periodontitis, a special periodontal cleaning called scaling and root planing (deep cleaning) will be recommended. It is usually done one quadrant of the mouth at a time while the area is numb. In this procedure, tartar, plaque, and toxins are removed from above and below the gum line (scaling) and rough spots on root surfaces are made smooth (planing). This procedure helps gum tissue to heal and pockets to shrink. Medications, special medicated mouth rinses, and an electric tooth brush may be recommended to help control infection and healing. Call if you have questions or concerns about periodontal disease, periodontal treatment, or dental implants.